This is the RGB LED strip that you have been waiting for ! This cULus Listed 3535 RGB LED Strip offers an incredible 120 LED chips per meter for a brightness second to none. Consuming 24W per meter, it needs to be installed in a proper aluminum channel for adequate heat sink. It is so bright that it can actually produce a neon-like, no dot lighting when used with our continous lighting profile. This LED strips offers creative options for upgrading the lighting of any room or commercial window display. It’s also the coolest way to decorate bars and display counter. This 3535 RGB LED strips is self adhesive and comes with wires on each end. There are no connectors available for this Strip. Our team will be glad to assist you in creating custom RGB LED bars for a minimal fee. *Please note that this product is not protected from the elements and should always be used inside an aluminum channel . 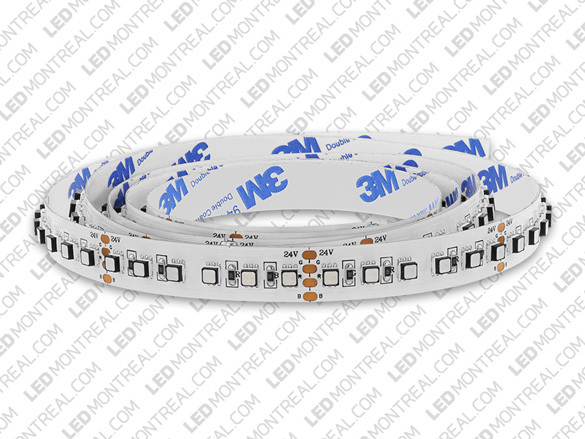 To operate this LED strip, you will need an RGB controller and a 24V power supply, using 28.8W per meter. WARNING: Do not use the Double Sided 3M Acrylic Tape on Strip that consume more than 9W/m or for more than 4 consecutive hours at full intensity (or commercially used) 5050 Led Strips, as there could be a risk of damage to the LED strip.